Maria Sharp was born Maria Zdenka Besan in Croatia in 1941, just after the Nazis had invaded Yugoslavia, and as a young child she witnessed “events that imprinted themselves upon my soul forever”. At the age of nine she emigrated to the USA and struggled along with her parents to succeed in the “New World”. 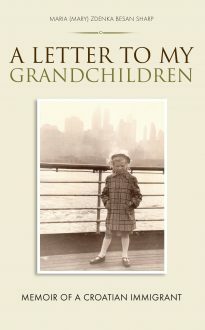 Years later she married an American and has since written this book for her two grandchildren to explain to them “who they are and how they came to be”. The book paints a warm and moving picture of life in Croatia in the first half of the 20th century. It then goes on to describe the horrors of World War II and the subsequent devastating aftermath brought on by the communist regime.